This year's race marked the Bicentenary of Paraguayan independence. 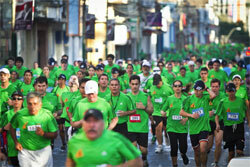 More than 2500 Paraguayans and foreigners alike took part, so that for several hours Asuncion was engulfed by runners. Edna Kiplagat, the fastest woman in the field, bided her time through the first of two 15km laps around the centre of Daegu writes Len Johnson. She lurked at the back of a pack which still numbered 19 at 30km, keeping a watchful eye out for any moves. There were none. Only entering the third lap, shortened to 12.195km did Kiplagat and her Kenyan teammates Priscah Jeptoo and Sharon Cherop move to the front. 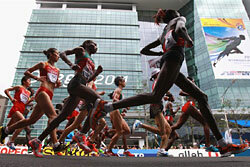 And stayed there, bringing Kenya the first Marathon medal sweep in World Championships, or Olympic history. Coming into a water station near 37km, Kiplagat and Cherop exchanged positions as they took their drinks. Cherop clipped Kiplagat's heels as they came away from the table and the favourite hit the road. A horrified Cherop quickly helped Kiplagat to her feet and she resumed running as powerfully as before. There may be grazes and abrasions, but a gold medal salves all. Even with that drama Kiplagat ran the fastest 5km of the race (16:11) between 35-40km. She kept going at the same pace to the finish, recording the most emphatic negative split (1:11:57 second half to 1:16:46 first half). For Kenya it was a complete turn around compared to the previous women's World Championships Marathon in Berlin two years ago, when no-one finished in the top 10. 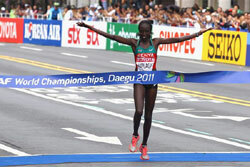 Kiplagat came into the race with the fastest time, and third-fastest in the world for the year, her 2:20:46 in London. And she won like the fastest runner in the race should, her tumble notwithstanding. For Ethiopia it was the opposite story, failing to add to a World Championships women's Marathon tally of Aselefech Mergia's bronze in Berlin. Mergia was never a factor in the race, but her teammate Aberu Kebede stuck bravely to the Kenyan trio when the break was made. She paid for her courage, finishing 12th. Bezunesh Bekele was best finisher for Ethiopia in fourth place. China took the silver medal in the World Cup team event, behind Kenya, with Ethiopia edging Japan out of third by 38 seconds. It is the first time Japan has not been in the top three since the World Cup was incorporated with the World Championships marathons in Athens in 1997. Harun Njoroge Mbuga moved into top gear at 39km to claim the men's title. In the women's race Tomoko Morimoto overtook front-running Kaori Yoshida with just over 2km to go.